The GDS-1000 Series offers 100MHz, 60MHz, 40MHz and 25MHz digital storage oscilloscopes with 5.6" color TFT LCD displays. With dual sampling modes, a 4000 point record length, a real-time sampling rate of 250MSa/s and an ET sampling rate of 25GSa/s, the GDS-1000 Series DSO provides an excellent balance of performance between memory length and sampling speed. Other major features include user-friendly menu tree operations, compact size, ergonomic design, USB PC connectivity and convenient SD/USB memory card support. The GDS-1000 Series is designed to meet today's most demanding engineering requirements and budgets. With the front panel featuring an SD storage slot, accessing your data is easier than ever before. The GDS 1000 series is able to capture image screen shots or waveform data and save it all onto an SD card quickly and easily with one button press. The panel settings can also be saved. An USB port on the back lets you connect to a PC to control the DSO remotely, and save all your data as well as set-ups. A total of 15 waveforms can be saved into memory to be displayed at a later time. Two saved reference waveforms and two live waveforms can be compared on the screen at the same time. All signal time and voltage related measurements can be shown on the screen simultaneously in real-time via the Measure key press. Several acquisition modes and 19 auto measurement functions help you to accurately measure the characteristics of waveforms. The advanced auto-set function lets the GDS-1000 Series automatically catch and display waveforms quickly. The arithmetic functions and FFT functions keep you aware of updated measurement results in real time. With little effort, the GDS-1000 Series can provide the right information for test results. The GDS-1000 Series has an enhanced 1kHz calibration signal. Its output frequency is adjustable from 1 kHz to 100 kHz and has an adjustable duty cycle of 5%~95%. Due to the flexible output, the calibration output can also be used as a basic signal generator for other applications. For educational purposes, instructors might not want to use the Autoset function on the DSO when they are teaching how to use oscilloscopes. 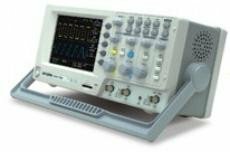 On the GDS-1000 Series, the Autoset function can be disabled, allowing students to manually operate the oscilloscope functions to further enrich their learning experience. Freewave DSO remote control and monitoring software is fully supported for the GDS-1000 series DSOs and is available free of charge from the GW Instek website. Freewave lets you remotely monitor the DSO, capture waveform data or even capture screenshots. Via a USB connection, Freewave is able to provide near-realtime monitoring and control. Flexible saving options allow you to capture data for later analysis and observation. Screen images can be captured to bitmap or jpeg formats. Waveform data can be saved to CSV for spreadsheet manipulation or computer analysis. Waveforms can also be saved as AVI movies to observe signal variation over time. By providing the Global Lifetime Warranty Program for the GDS-1000 digital storage oscilloscope series, we believe you can have the same confidence as we do in the quality of each GDS-1000 DSO. By purchasing a GDS-1000, you can be assured of a highly economical, low maintenance, quality DSO backed with the protection of the LifeTime Warranty program. The Lifetime Warranty Program guarantees customers will be supported regardless of their location. Customers will receive at least 5 years of full support even after production has ceased. For more details and applicable conditions regarding the LifeTime Service program, please visit the GW Instek website www.gwinstek.com/llw or consult your nearest distributor. Coupling AC , DC , LF rej. , HF rej. , Noise rej.